Developed by Francisco Cantu, Fileup is a new OS X utility that lets you quickly share files through Dropbox by dragging them onto a menu bar icon. Unlike other apps that have implemented the same sharing mechanism and user interaction (which Dropbox surprisingly doesn’t support with their own menu bar app), Fileup adds filters for file types, integrates with Notification Center, and lets you set up templates for naming files through a simple syntax. The idea is reminiscent of Vemedio’s shortlived Sharebox experiment, but, as required by Dropbox, Fileup is a separate menu bar utility that doesn’t interact with the official Dropbox client. 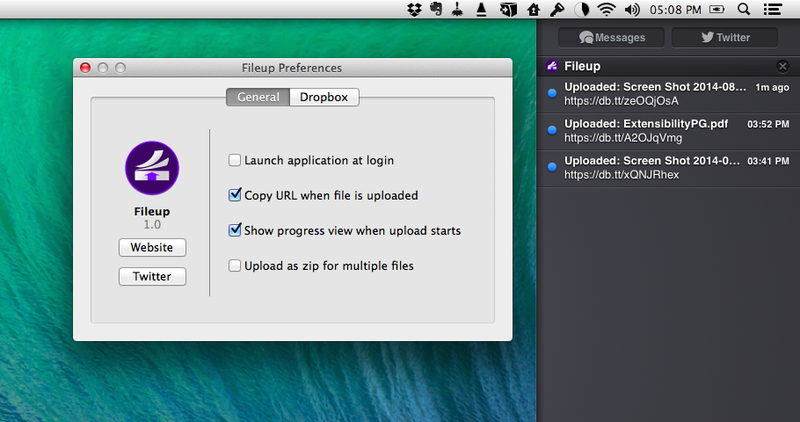 Like Droplr, CloudApp, and other file sharing tools for the OS X menu bar, Fileup accepts files from the Finder via drag & drop. The app can automatically upload a .zip file for multiple files dragged onto its icon at once, and you can set a basic destination folder in the Preferences. The naming syntax for uploaded files doesn’t come with the clickable placeholders found in apps like Hazel or Apple’s Finder, but it’s simple enough to type out manually and customize how files are named by Fileup. If you find yourself constantly uploading certain file types to specific folders in your Dropbox, Fileup lets you assign settings to extensions. In this way, you’ll be able to upload .pdf files to your /PDF folder, with .png screenshots going into, say, /Images. Files are automatically uploaded and shared, returning db.tt short URLs that can also be copied by clicking Fileup’s messages in Notification Center. Fileup‘s basic concept is nothing new, but the app’s integration with Dropbox is well done and the combination of custom filenames and extension filters provides the right amount of versatility to make it a great choice for quick and flexible Dropbox sharing. Fileup is $4.99 on the Mac App Store.